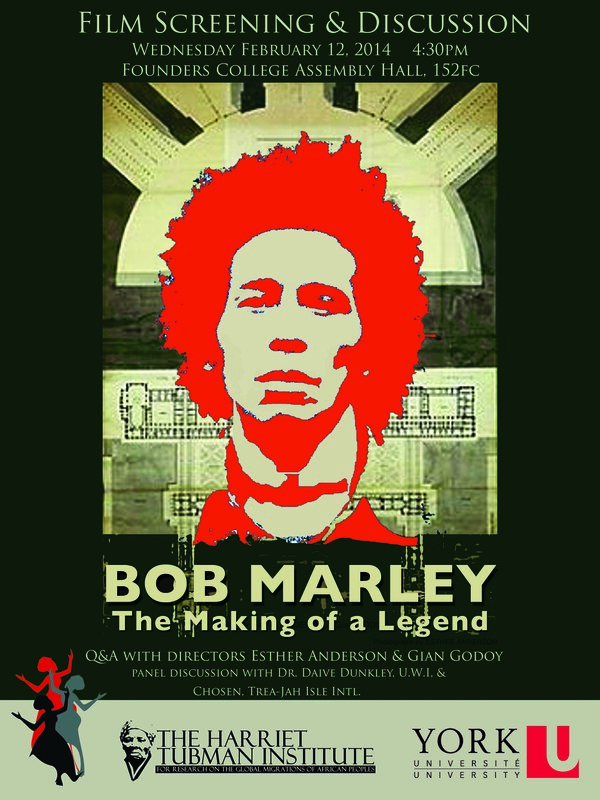 On Wednesday, February 12th at 4:30pm, the sixth annual Performing Diaspora series screened the award-winning film Bob Marley: The Making of a Legend by Esther Anderson and Gian Godoy, based on footage shot in the early seventies which examines aspects of the life, creativity, beliefs and influences of young Marley and the Wailers, when the idea of a Jamaican supergroup akin to the Beatles or the Rolling Stones was just a dream.The film showed us the launch of their international career with “Get Up Stand Up,” “I Shot the Sheriff,” and the “Burnin” and “Catch a Fire” albums that brought to the world Reggae music and Rasta consciousness. Following the screening of the film, directors Esther Anderson and Gian Godoy engaged the audience in Q&A. Given the intention of Performing Diaspora in prominently featuring the voices of Africans and persons of African descent in Canada, this event was recorded and transcribed, in an effort to collect oral histories and create a record of the experiences. It will then be edited for a Performing Diaspora Series of publications, to be published at a later date.